Grand Central Publishing, 9780446198226, 320pp. Easy Rawlins is out of the investigation business and as far away from crime as a black man can be in 1960s Los Angeles. But living around desperate men means life gets complicated sometimes. When an old friend gets in enough trouble to ask for Easy's help, he finds he can't refuse. Young Brawly Brown has traded in his family for The Clan of the First Men, a group rejecting white leadership, history, and laws--and they're dangerous. Brown's mom, Alva, needs to know her baby's okay, and Easy promises to find him. His first day on the case Easy gets harassed by the cops and comes face to face with a corpse. Before he knows it he is on a short list of murder suspects and in the middle of a frenzied police raid on a Clan of the First Men rally. The only thing he discovers about Brawly Brown is that he's the kind of trouble most folks try to avoid. It takes everything Easy has just to stay alive as he explores a world filled with promises, betrayals, and predators like he never imagined. 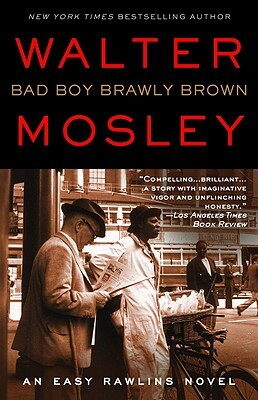 BAD BOY BRAWLY BROWN is the masterful crime novel that Walter Mosley's legions of fans have been waiting for. Written with the voice and vision that have made Walter Mosley one of the most important writers in America, this book marks the return of a master at the top of his form. Walter Mosley is the author of the acclaimed Easy Rawlins and Fearless Jones series of mysteries, as well as numerous other works of fiction and nonfiction. He has won the Anisfield-Wolf award, a Grammy Award, and in 2004 received a PEN USA lifetime achievement award. He was born in Los Angeles and lives in New York.